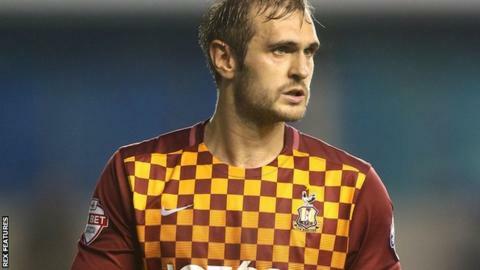 James Hanson's powerful header earned Bradford a hard-fought victory against Blackpool at Valley Parade. The striker connected with Tony McMahon's right-wing corner on the stroke of half-time following a dominant display by the hosts. Blackpool almost drew level in the second half but David Norris's shot was blocked by Rory McArdle and the ball looped safely up and over the goal. Following their fourth win in six, the Bantams are now ninth in League One. Match ends, Bradford City 1, Blackpool 0. Second Half ends, Bradford City 1, Blackpool 0. Corner, Bradford City. Conceded by Emmerson Boyce. Attempt missed. Jack Redshaw (Blackpool) right footed shot from outside the box is just a bit too high. Attempt saved. Billy Clarke (Bradford City) right footed shot from a difficult angle on the left is saved in the top centre of the goal. Attempt saved. Tony McMahon (Bradford City) right footed shot from outside the box is saved in the centre of the goal. Substitution, Blackpool. Kwame Thomas replaces David Norris. Jarrett Rivers (Blackpool) wins a free kick on the right wing. Emmerson Boyce (Blackpool) wins a free kick on the left wing. Substitution, Bradford City. Billy Clarke replaces Devante Cole. Corner, Bradford City. Conceded by Charles Dunne. Nathan Clarke (Bradford City) wins a free kick in the defensive half. Substitution, Bradford City. Gary Liddle replaces Lee Evans. Substitution, Bradford City. Nathan Clarke replaces Reece Burke. Attempt missed. David Norris (Blackpool) right footed shot from outside the box is close, but misses to the left. Substitution, Blackpool. Henry Cameron replaces Jim McAlister. Jarrett Rivers (Blackpool) wins a free kick in the attacking half. Foul by Jarrett Rivers (Blackpool). Corner, Blackpool. Conceded by James Meredith. Corner, Blackpool. Conceded by Rory McArdle.